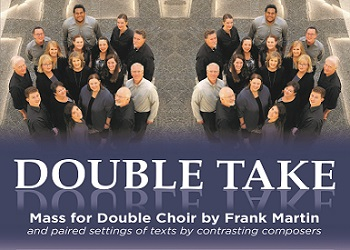 Caritas A Cappella Ensemble will double the joy of choral music when it explores and celebrates dualities and contrasts in its Feb. 24 charitable concert, “Double Take.” It will open with Frank Martin's rarely performed Mass for Double Choir, followed by four pairs of pieces, each featuring a single text as interpreted by two composers. The auditioned 24-voice a cappella chorus is conducted by Artistic Director Cathy Youngblood. Martin finished composing his Mass for Double Choir in 1926, but it received its debut performance only in 1962, partly, he said, because he considered it a matter between himself and God. Composers featured in the paired works represent almost 500 years of music and words. One such pair will be “Love Is a Sickness,” a text by 16th-century poet Samuel Daniel, set to music by Charles H.H. Parry from the 19th century and Dale Trumbore from the 21st. In its charitable mission, “A cappella artistry with a purpose,” Caritas will donate half the ticket proceeds to Big Brothers Big Sisters of Central Carolinas. Concert tickets are $20 in advance or $25 at the door; and $5 for students with valid ID. In addition, those 65 and older can buy tickets for $17.50 only in advance. For tickets, visit https://www.carolinatix.org. For more information visit CaritasACappella.org or www.facebook.com/CaritasACappella.